Sold by Julia's Book Store and Fulfilled by Amazon. Gift-wrap available. Celebrates the life and work of the first democratically elected leader in 1,000 years of Russian history, who presided over the disintegration of the Soviet Empire and the move to a free-market economy. Aron, born in Moscow and now director of Russian studies at the American Enterprise Institute in Washington, DC, has written a weighty volume (in content and size) on the hottest topic of the last quarter of the 20th century--the fall of the Soviet Union. Focusing on the personalities (Yeltsin and friends) that have attempted to remake Russia, this work is a massive apology for its post-1989 history. Aron disputes the current Western press view of Yeltsin as an alcoholic and works hard to show that Yeltsin--who's been overcoming adversity from the time he was nearly drowned by a tipsy batushka at his baptism--has faced difficulties from the beginning of his presidency. "As the pace of the revolution quickened," Aron argues, "Boris Yeltsin's personal history became more tightly entwined with his country's history." Now with Yeltsin's early retirement, scholars will begin a closer examination of his impact on the emerging Russian democracy. His epitaph will likely read, "He made irreversible the collapse of Soviet totalitarianism." Not the last word on the Yeltsin presidency but recommended for public libraries. The timing of this thorough, scholarly journey through the life of one of the twentieth century's true world historical figures is unfortunate. Released in mid 1999, it misses the final, and decidedly pivotal, story of Boris Yeltsin's last months in power, when he finally identified a worthy successor to carry the standard for free markets, democratic process, and rule of law in the erstwhile authoritarian Russian state. After gamely ushering the reader through the (almost literally)heart-stopping crises and byzantine political intrigues of Yeltin's career, the book ends with the ailing president mired in the financial debacle of 1998, running out of time and options, and forced to play ball with his reactionary Prime Minister. Luckily we all know how the story played out in the end, with Yeltsin's dramatic New Year's resignation and the ascension of Vladimir Putin to the presidency. As the reader comes to know Yeltsin in the course of this book, the scope of his political genius and daring reveals itself so plainly and effectively that this reader yearned to know something about why Putin impressed him to the point of bequeathing his legacy to him. Nonetheless, as a work of history rather than political evaluation, "Yeltsin: A Revolutionary Life", succeeds broadly in demonstrating the varied levels of its subject's titanic efforts to transform a near-death society into something which may well one day become a great nation. Yeltsin's successes unfold on three levels. The first, and most central to the book, is the defeat and dismantling of the inhuman Stalinist Soviet society which had strangled Russia for sixty years or more. This astounding victory set the stage for Yeltsin's assumption of the presidency, after full and free elections, and the various political victories he achieved over the course of his two terms in office. Finally, and probably most importantly for Russia and the rest of the world, Yeltsin began an irreversible process in this country for the first time in its history: a drive toward private property, free prices, and enterprise which began the nation's slow march into the community of liberal-minded societies. 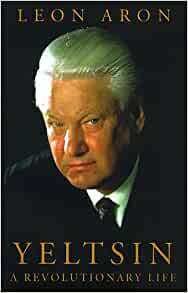 The book does a fine job of demonstrating the ruthless personal drive which propelled Yeltsin to greatness. From his early days in the semi-Siberian city of Sverdlosk, when he blew two fingers off his left hand while stealing munitions from a factory on a dare from some teenage friends, the author paints a vivid portrait of a budding iconoclast. This reader yearned for more about these formative years, but the thinness here is understandable, given the opaque nature of Soviet style historical documentation. The inner workings of the communist maze confounded Yeltsin as much as is does the reader--it's a truly incomprehensible system, and makes for slow going sometimes as we follow Yeltsin on his journey of discovery. It becomes exciting as his speeches start to reflect his sense of the waste and obscene inhumanity of the entire system. This reader was looking for that pivotal moment, though, that one or two unique events which crystallized Yeltsin's thinking and made him realize his destiny. Sadly, those moments are buried as effectively as the system Yeltsin brought down. This book gives us a great record of the "how" of what happened, but only hints helplessly at the "why". All in all, it's an ambitious read, but an informative and thoroughly competent one. In a way, it makes sense to leave Yeltsin at the end struggling and fighting away against his physical and political decline. This is the milieu in which he clearly thrived. Overall victory seemed to soften him. So, in order to get a sense of the real man, perhaps we have to forgo the happy ending. 2.0 out of 5 starsApologia for a fallen idol. Nearly all of Boris Yeltsin's many admirers in both Russia and the West have seen their benign image of the ex-Russian President shattered by events. The "man of the people" who campaigned against the privelages of the nomenklatura (the Soviet bureaucracy) later presided over a regime that made the corruption and elitism of its Soviet predecessor seem miniscule by comparison. The so-called "democrat" used deadly force to disband the first Russian parliament and established himself as a virtual dictator by concentrating all real power in his own hands and those of his chosen subordinates. Furthermore, the champion of national "sovereignty" who encouraged the dismemberment of the Soviet Union waged a bloody and fruitless war when the same principle threatened his own power in Chechnya. These facts have combined to undermine Yeltsin's reputation both at home and abroad. In this massive biography, Leon Aron attempts to rehabilitate his hero. He writes an often compelling account of Yeltsin's life and career (through late 1998, when the Russian leader was rapidly being reduced to a figurehead status). However, it is fatally compromised by its one-sidedness. The most widely used sources are Yeltsin's own self-serving memoirs, interviews with his hand-picked officials, and articles written by Yeltsin-friendly journalists in both the Russian and Western media. A dominant source is Radio Liberty/Radio Free Europe, the Cold War-era propaganda service. While all of these biased accounts are accepted at face value, the views of Yeltsin's foes are presented (when they are presented at all) in the worst light possible. Yeltsin's two main political opponents, Yegor Ligachev and Gennady Zyuganov, are both badly misrepresented, or even slandered, in this book. Fortunately, both have authored books of their own which are available in English (_Inside Gorbachev's Kremlin_ by Ligachev and _My Russia_ by Zyuganov) so we can hear the views of these two thoughtful and patriotic men in their own words and judge for ourselves. The Boris Yeltsin of Aron's book is like two different people. First and foremost, he is the "democratic" leader who freed Russia from the Communist "experiment", dismantled the Soviet "empire", and laid the foundations of a "modern" state and economy. The corrupt and authoritarian ruler that emerged later was an aberration, not the "real" Yeltsin. Aron even implies that his top advisors isolated him and ruled in his name (the same excuse given by apologists for Tsar Nicholas II and Josef Stalin). He is only fooling himself, though. There were not "two" Yeltsins. The demagogue with a talent for inciting the public was destined to become a dictator who ignored them. Opportunism was his hallmark. After he failed to rise to the top of the Soviet Communist government, he joined with the forces dedicated to bringing it down. He stood with the Russian Parliament in defense of the constitution during the "August Coup" of '91, then tore up the same constitution and sent tanks against the same Parliament two years later when they stood in the way of his own plans. Yeltsin acted as a "democrat" when it suited his purposes, not out of genuine conviction. He did not bring about the reforms of glasnost and perestroika, he exploited and ultimately hijacked them to satisfy his own ambition. The "unrecognizable" Yeltsin of the mid-'90s, whose behavior is so baffling and frustrating to Aron, is perfectly recognizable to those who saw through Yeltsin's game from the beginning. Yeltsin was a daring and shrewd politician who battled his way to the top, but his political triumph has been a disaster for Russia. The population is now decreasing at a rate more than twice as high as during the worst years of famine and Stalinist terror in the 1930s. Instead of producing a free and prosperous Russia, the catastrophic economic experiments of Yeltsin's regime have impoverished his nation to the benefit of a tiny minority. Crime, drug use, suicide, and malnutrition are at an all time high. In the final analysis, no amount of excuse-making by apologetic works such as this can refute that Yeltsin's true legacy is one of humiliation, failure, and ruin.